LIKE A PLANT STARTS as a seed, sometimes an idea starts as an initiative before it takes root. 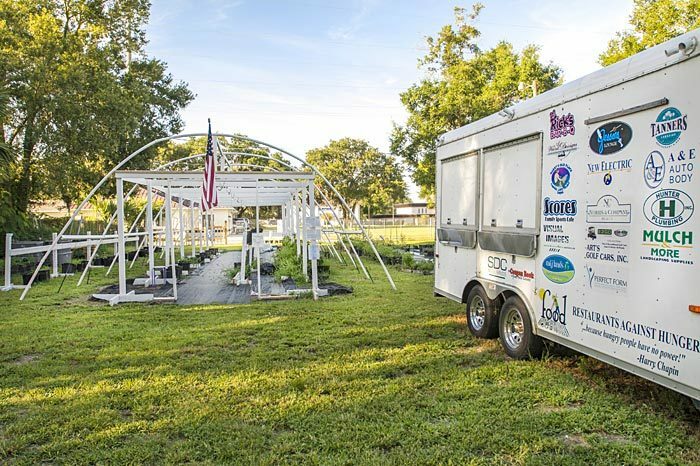 About 17 years ago, colleagues with a similar desire used their initiative to form Restaurants Against Hunger Community Farm to raise money to help The Mission in Winter Haven. Members rebuilt the Mission’s kitchen and service area, showers and laundry area over the years. But Piche has Gil Daigneau in Lakeland, a friend and cooperative farmer, who agreed to help, providing not only his expertise, but also the vegetables and eggs from his chickens to the community garden’s members. The members pay a certain amount of money to come and pick the vegetables and eggs. “I thought we could take a piece of his farm and plant it,” Piche says. “Gil (Daigneau) suggested planting a garden in downtown Winter Haven.” Agreeing to move forward on that venture with Restaurants Against Hunger Community Farm, Piche researched the requirements of having a garden in the City of Winter Haven and how receptive the area would be to such a venture, but not sure what the cost versus revenues would bring. “We were behind the eight ball, but had things grown to have stuff to sell. The growing process began in August and September 2015. We opened the farm in February (2016) and missed the whole fall season,” he recalls. Growing to 130 members participating in the garden venture, because of the unknowns, all were charged $100 to participate. That became their bank to pay for their picked produce, writing down their name and what they harvested in ledgers on the honor system. That selection is their year-round staple crop with Daigneau knowing what version of what people want and use with his more than 26 years of experience. If someone participating in the program wants something special they will give it a shot and try growing it. The growing process for this fall is still in the working stages. Piche says that it is easier to have Daigneau grow the things at the farm and then bring them into Winter Haven. Anyone can participate. To sign up for the 501(3)c-designated charity, call (863) 604-1743. Charge is a one-time $50 annual fee and a $100 fee to use as credit to pick vegetables. The garden will begin in September with lettuce and tomatoes ready in October. The garden is found at Avenue D Southwest, actually across the street from Egg Haven in Winter Haven and behind a brewery.